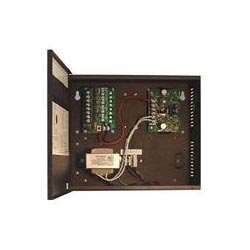 The HONEYWELL-POWER-HPV3DC4UL is a switching power supply/distribution unit that converts a 115 VAC input to 6, 12, or 24 VDC @ 2.5A. The power supply distributes current among the individually fused outputs. The unit comes in a durable, steel cabinet with plenty of additional room for wiring. Mounting hardware is included for easy installation. The HPV3DC4UL is great for Security and CCTV systems requiring additional power.